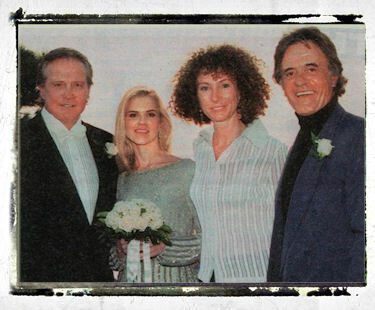 It was "Marriage, Italian Style" as three-times divorced Lee Majors finally tied the knot again! "I do - an it'll be forever" said "The Six Million Dollar Man,", 63, who exchanged vows with pretty Faith Noelle, 28, at a quaint hotel overlooking the Mediterranean Sea. And the Enquierer has the exclusive story and photos of the hush-hush ceremony, which was attended only by two friends! It was a simple wedding - but complications made it the marriage that almost never was. "We nearly never got married," laughed Faith. "It was a paperwork nightmare - though it all turned out like a beautiful dream!" The November 1 wedding took place at the Il San Pietro Hotel in Positano, Italy, on the spectacular Amalfi Coast. "We picked it through friends of ours," Lee told The Enquirer. "They had their honeymoon there about 30 years ago, and they've been going back ever since and telling us how beautiful it was. "I was doing an appearance in Milan and so I was looking around for a place, something special. Our families were scattered all over the United States so we decided to keep it simple and just find a romantic spot for us. "We flew from Milan to Naples, I hired a car and drove to the hotel. The place took our breath away and we said: "This is it, let's do it!" "The hotel was carved into the side of a mountain. It took the guy 10 years to build it, one room at a time. He stopped at five. It was impossibly romantic and overlooks the sea. "The lady owner of the hotel, Virginia Cinque, had no idea who I was. Before we arrived Faith had made a few calls to find out about the place. As it turns out Mel Gibson, an old friend, was staying there. The owner said to him: "Who is this Meester Majors?" Mel laughed and said:"He's an O.K. guy." "I guess he gave me a good report - we were treated like royalty. They saved us the bridal suite. We married on the hotel balcony as the sun set. It was just breathtaking." Lee wore a black Valentino tuxedo with a white bow tie. Faith was dressed in a $5,000 platinum-colored gown by Badgley Mischka. The mayor of Positano officated. Lee's friend Terry Kiser - who played Bernie in the "Weekend at Bernies" movies - was best man, and his wife Sylvie was bridesmaid and also took the wedding photos. "The spot where we married was so unbelievably beautiful," Faith told the Enquirer. "It was a piece of heaven. There were tears in both our eyes." The after-wedding celebration was a gourment dinner for four in the hotel. The newlyweds stayed in Positano 10 days, shopping, sightseeing and enjoying quiet romantic dinners. "We took a ferry one day to the Isle of Capri and drove around in a cab", said Faith. "The driver was an old man and he showed us pictures of his little boy, very young, and we said:"So how old is your wife?" "He cracked us up as he said in funny broken English: "I gotta me a fresh-a-wife". Ever since, Lee has been calling me his "fresh-a-wife". But the ceremony nearly never came off thanks to the paperwork involved, Lee disclosed. "It's a long story. I don't think they want you to get married in Italy. "We tried to do some paperwork beforehand in Las Vegas, where we live. Couldn't do that. "we had to fly into Los Angeles several times and see the Italian Consulate there. They were no help at first. We had to get everything - birth certifcates, passports, divorce documents - then have them translated into Italian. "When we got to Italy we had to go through the same rigmarole all over again. "In Milan we had to go to the U.S. Consulate's office. And then as we were about to leave for Naples they told us the paperwork might not be legal because the Northern District may not recognize the Southern District! "Even after we were married we weren't 100 percent sure till we got that certificate in our hands from the mayor of Positano!" "But she didn't really look 20 - she looked 22 ! "On our first official date I took her to the Super Bowl. We counted that ever since as our anniversay. "I even proposed at a Super Bowl party. We wre watching the game at a freinds house three years ago and I handed her a little ceramic football. It had a hinge on it. She opened it and inside was a 7 1/2 carat marquis diamond in the shape of a football. "She was dumbstruck - and I wasn't saying anything either. One of my pals dug me in the ribs and I yelled; "Oh yeah! Will you marry me?" "I had to be prompted. But it was a hard question for me to ask. I was very, very afraid of marriage. I'd had three that failed. "But the realization suddenly came to me that Faith had done more for me in the time I've known her than anybody ever did. "When Faith met me I was an old man with a limp. I was crippled, very unhappy and drinking a little too much vodka. "She transformed me into standing up straight and proud!" Lee had a pronouned limpe from his college football action and stunts he did for hsi shows "The Big Valley", "The Fall Guy" and "The Six Million Dollar Man"
But he said the limp is gone thanks to a product he's about to endorse. "Its called Arthro-7. It's a natural health supplement. I have a bad knee and its really helped me." The couple is planning to move from Las Vegas to Los Angeles and Lee is looking forward to new acting roles. "He's happier now than he's ever been,"said Faith. "I'm happy and it's great." And Lee declared: "The fourth is foever!"